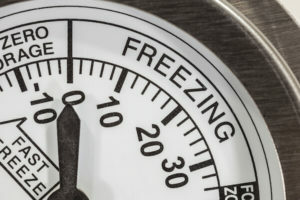 When a refrigeration system reaches the proper temperature, the compressor and condenser shut off while the evaporator fans continue to run 365/24/7. As the evaporator motor uses electricity, it generates heat and introduces that heat into the refrigeration box – walk-in cooler and/or freezer system. The temperature in the box then begins to rise and the whole system starts up again. Seems kind of inefficient, doesn’t it?? It did to Refrigeration Technologies’ Engineers! That is why we are going door to door to educate owners as to how simple technology will bring them in to the 21st century!! How? By maximizing the time the compressor and condenser can be off without sacrificing the temperature of your system!! Consider retrofitting your current evaporator fan motors with EC Motors (Electronically Commutated) as well as adding the ArtikControl™ – Intelligent EC Fan Motor Controller. EC Motors + ArtikControl™ = A Lot of Energy Savings! Department of Energy Studies have shown that ECM’s use 50% to 70% less energy in a walk-in cooler, refrigeration and freezer system than shaded pole motors and 30% to 40% less energy than permanent split capacitor motors (PSC). In one test performed by the Food Service Technology Center (FSTC) a standard efficiency, shaded pole motor consumes 135 to 150 watts of energy versus an EC Motor which only consumes 45 to 50 watts of energy. The test data also showed that while the shaded pole motor produces 390,000 btu’s of heat, the EC Motor was only producing 80,000 watts of heat which equates to less compressor and condenser run times. Plus, by installing the ArtikControl™ – Intelligent EC Fan Motor Controller along with the EC Motors, the motors can be reduced down to run at a lower speed and use less energy when the compressor and condenser fans are in the off cycle. While EC Motors are becoming the norm in newly manufactured walk-in coolers and freezers, they were not standard in most models prior to 2016 which leaves a lot of older systems still consuming large amounts of energy. Retrofitting an older system with the new technology is easy. EC Motors consume less energy than Shaded Pole or PSC Motors, which means lower energy bills. They also produce less heat which means the compressor and condenser run less – use less energy and extend their operational lifespan. EC Motors + an ArtikControl™ – Intelligent EC Fan Motor Controller offer short ROI’s plus many Electric Companies are offering excellent rebates and Incentives to make the change. With the energy saved from less energy consumption by the motor itself and less energy consumption by the system as a whole because of lower heat infiltration, annual energy savings can be substantial. Refrigeration Technologies, LLC provides a 5-year warranty on the Motors and the ArtikControl™. For More Information, as to how your operations can benefit from having this Retrofit Completed, please contact Refrigeration Technologies, LLC at 888-286-3091 and ask to speak with one of our Sales Engineers.